Helicon B.V.; severely damaged after hard landing during a passenger flight probably due to overweighted and hot temperature conditions; this flight is reported as to be the last intended-one before giving helicopter to a museum ! 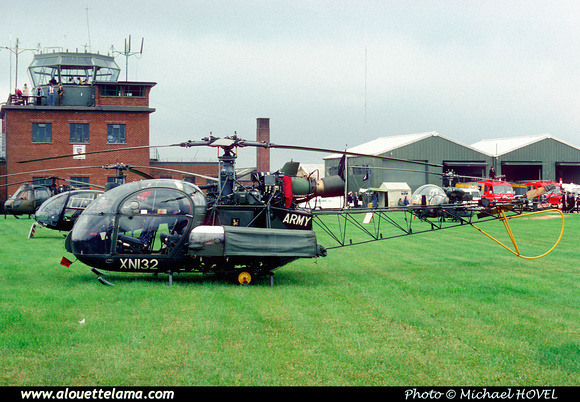 XN132 Eurocopter (Aérospatiale) SE3130 Alouette II MSN 1185, Army Air Corps, 6A Flt - Greenham Common - EGVI - 26-06-1977 - Photo Michael Hovel, Kenneth Swartz collection. Dernière mise à jour/Last update : 02-09-2012. L'usage des logiciels Firefox ou Safari est recommandé. The use of Firefox or Safari browsers is recommended.